with affordable built-in solutions from Cablecast. Cablecast offers smart, affordable live and on-demand solutions for stations that cover government meetings and other municipal programming. 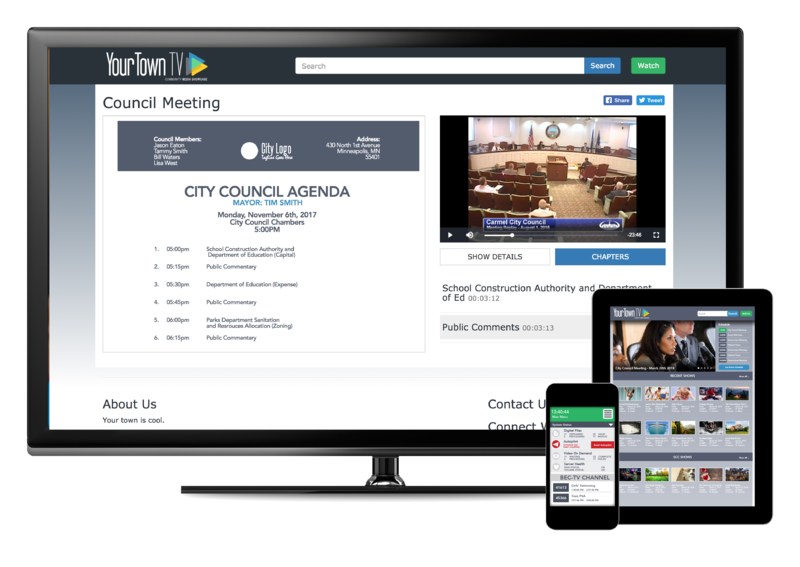 With powerful features designed to eliminate costly hardware for streaming on-screen graphics, as well as built-in chaptering and meeting agenda solutions that can save you money on costly third party services, Cablecast is your one-stop shop for municipal meeting coverage. Keep the community informed. Reach residents without cable on Apple TV® and Roku® devices using Cablecast Screenweave. Cablecast allows you to insert chapter markers as the meeting occurs. Agenda items can be entered in advance. Both chapter markers and agenda items can be edited at any time with Cablecast’s built-in and intelligent tools. Attach your agendas and meeting minutes to your VOD file for display on your website or on Cablecast's VOD page. Agendas, meeting minutes and any other documentation can also be made available for download on any device. Cablecast supports closed captioning for all content distribution on cable and the web for live and on-demand content. Cablecast web publishing solutions are optimized for SEO and social sharing platforms. Also enjoy complete control of your meta-tagging and metadata display.